There are several loose ends from my time as an ALT that I had yet to tie up. One of them was the drawing I had promised the underclassmen of the English club. I had drawn the upperclassmen for a poster for the culture festival this past June but hadn’t had time to do a picture for the underclassmen. So I set Halloween as a deadline for myself and spent about two weeks making an original, full-color drawing of the 7 members in costumes. It had been a long time since I sat down to ink and color by hand instead of just doing it on the computer. Adorable Halloween wrapping paper: love how a moon ended up framing a face by chance. My stance on that has softened somewhat as I remember what the draw of teaching Japanese had originally been. And I realized that hands down, what I came to hate about work was that I felt like I wasn’t getting even the bare minimum of respect that someone at the bottom of the school totem pole should get. Not consistently anyway. Right now new ALTs are probably thinking about things such as “What should I have the students call me?” I’m a big proponent of Mr./Ms.+Last Name, especially if that is the way teachers are addressed in the ALT’s home country. It’s also a matter of respect and establishing yourself as being above the students. Maybe that sounds a bit high and mighty, but in a society as hierarchical as Japan’s, and in regions that still often treat foreigners as curiosities rather than human beings, it’s important to establish who’s who. People who are at least vaguely familiar with Japanese culture might have some ideas about the sempai-kouhai relationship. While I was aware from the start that sempai, one’s “senior” be it at work or in life, were regarded with respect by their kouhai (juniors), I never realized how deep and important this relationship was until I’d been working in Japan for a couple of years. Students actually bow to their sempai. For example, 10th graders bow to 11th and 12th graders, and the 11th graders bow to the seniors. In my school’s English club, all the students went by cutsie nicknames, but the underclassmen never addressed the upperclassmen without an honorific, even if it meant saying somewhat silly sounding things like nickname-chan-san. When referring to the one junior in the club, the sophomores, talking amongst themselves, would always call him Last Name-sempai. When talking about him to me sometimes they’d use his first name, I don’t exactly know why, but they never called him his first name to his face. If students show that much respect to each other, what kind of sense does it make to have them call ALTs by their first names? The majority of ALTs might not have teaching certification, but they’re still adults. What’s more, they get put into schools, in name if nothing else, as “assistant language teachers.” When school faculty and staff address the ALT by the ALT’s first name, especially without the -sensei honorific, they are destroying what shred of credibility the ALT might have had with the students. When students don’t take the ALT seriously, they don’t take the class seriously, and the class becomes a pointless waste of everyone’s time. In contrast, the two (out of 10) homerooms that did address me as Ms. Last Name, as I had explained at the beginning of the school year, were much more open to participating in the class, and performed better on tests. Could it be because they took that extra step of actually understanding and using a basic part of American culture? Ultimately, and perhaps unfortunately, it is up to each individual ALT to set the rules for how students and coworkers address them. I hope this made anyone thinking of letting students address them by first name alone think more deeply about their position. A moment from the party ESS threw for the Seniors, and also as a Farewell for me. There’s so much going on right now in terms of getting ready to make the move back to the States, so I probably won’t be writing any posts until I get back home. I’ve been pretty busy helping English Speaking Society (=ESS, or English club) get ready for the school festival. Well, it’s all stuff I volunteered to do. The members are doing the heavy lifting, I’m just adding a bit of technological sparkle. I don’t particularly like Glee, but I gotta give the show props for the a cappella version of Katy Perry’s “Teenage Dream.” ESS members weren’t planning on doing it a cappella, but with only one boy in the club the girls in charge put him on backing vocals, and when freshmen students joined in late April (=too late to really learn the songs) they got backing vocals too. Their voices alone ended up sounding so rich that I told them to ditch the instrumental track. I can’t believe how good they sound! I know they’re gonna blow everyone away with the a cappella greatness. The final setlist was decided only a few weeks ago, but most of the songs had been decided for a couple of months. The club members had suggested writing the songs’ lyrics on poster boards and putting them up around the classroom we’d use for the festival, but I told them that probably no one would read them. I proposed timing the lyrics to the music, making subtitles in essence, and projecting them behind the dancers. They agreed to the idea and I’ve been working on that whenever I got a spare moment. Luckily pop songs have pretty simple timing so it’s only been taking me about an hour to do each track. I love having a Mac. It turned out that many other clubs and classes ended up wanting to do things with video, which means that there aren’t enough projectors to go around. Luckily, I have a friend who has a projector, so I’ve borrowed hers. I haven’t tested it out yet so I’m not sure 100% certain that we’ll do this, but I’m ready for it! Interestingly, one of the senior classes asked me to be in their film that they’re making for the festival. They said they thought it would be funny to have me in their video speaking Osaka dialect. Ahahaha…I don’t know if one of the students in the class is from Osaka or they just think Osaka dialect is funny. I probably won’t get to see the finished movie until the school festival this Saturday, but I’m looking forward to that as well. Well, I should get cracking on the subtitles for the remaining tracks. I think I’ll do “Landslide” next. It was my second try, but I passed N1 of the JLPT. Woo! Ahahaha…it has now been over two months since the Arashi concert in Osaka. I think it’s fair to say at this point that I will never write a post about it. It was great, it was fun, don’t get me wrong, but I just don’t have it in me right now. Lately I’ve been feeling like I’ve worked really hard to do the things JET tells us to do: become a part of the school and engage in “cultural exchange.” I’ve gone to clubs besides ESS, participated in classes other than English classes, cleaned in the shokuinshitsu…and it feels like it was mostly for nothing. I now feel like less a part of the school and like I’m having less of an impact than ever. A huge part of this may simply be because I’m comparing my situation now with my previous school, which matched my background and experience (and therefore ability to fit in) much better. That’s what I’ve been feeling for the past several months anyway. Even though I had made up my mind not to seek reappointment while I was resting in the States, I wanted to discuss it with my supervisor and vice principal first. I was caught off guard when on my first day back in Fukuoka, still messed up from jet lag and not in the best of moods, my supervisor asked me if I was staying or not. The part of my brain that was awake and rational was saying, “Don’t answer that! Don’t answer that right now!” But my Autopilot said, “I think I should go home,” to which my supervisor replied with an “Oh” and ran off somewhere. I was confused, as I assumed my inclusion of “I think” would’ve shown I wasn’t 100% sure. Well, maybe we’ll discuss it later, I thought. I remembered reading somewhere, maybe it was the CLAIR newsletter, that while contracting organizations may push their ALTs for early answers, that ALTs should remember that they have until February to decide whether to recontract or not. I was thinking, “Why are they pushing this on me in such a hurry?” At least as far as the prefecture was concerned, the offered extension was proof of satisfactory performance, as 4th and 5th years are not freebies like the 2nd and 3rd years can sometimes be. The way that whole business with the recontracting papers was handled left a bad taste in my mouth, but what could be done? Anyway things were starting to get better. I got over my jet lag induced insomnia (the opposite of when I go to the States; there I become narcoleptic), the atmosphere at work seemed better…then there was today’s ALT meeting that left me fuming. Lately we’ve been having guest speakers at these ALT meetings, which is a great thing. But I was blown away by what today’s guest speaker, a JTE, had to say.The topic of his seminar was the New Course of Study for English Education. He told us that no matter what, English education, as taught by teachers (not as envisioned by the Ministry of Education) focused on getting students ready for the university entrance exam. No big surprise there. This is something that’s been openly acknowledged for a while now. What blew me away was the teacher’s suggestion of what ALTs’ role within the New Course of Study would be. “What can ALTs do?” said the PowerPoint slide. So…basically you’re saying the Japanese government spends how much money on getting flesh and blood employees over to Japan so that they can…pronounce words? Something that CD players and electronic dictionaries can do just as well? 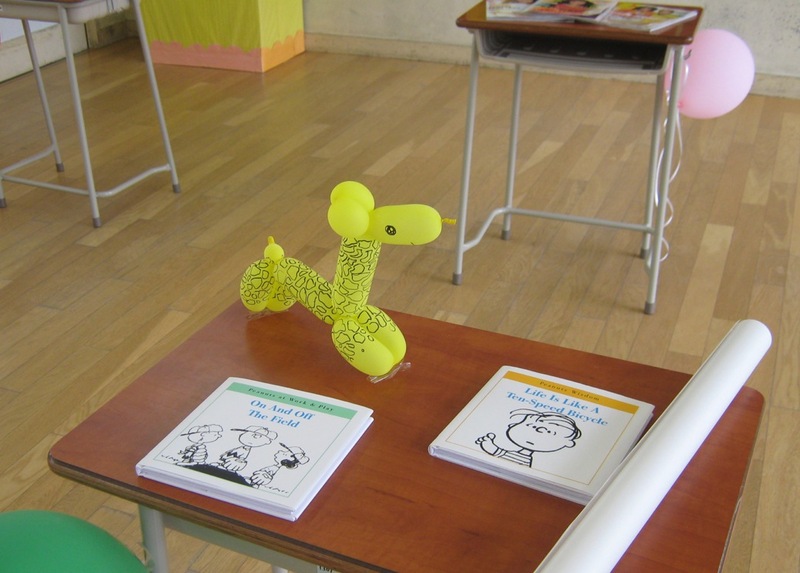 Then he added that by having ALTs in the room it creates a situation where students HAVE to speak English. So yeah. We’re here to pronounce words and force students to do something they otherwise have zero motivation and reason to do. Man, was I angry after that! At moments like those, I feel like I made the right choice. I’m going to miss the English Club students, I’m going to miss seeing the senior members take leading roles in the Sports Festival, I’m going to miss their graduations. I’m going to miss the freedom to move around by bicycle and train, to go where I want when I want. 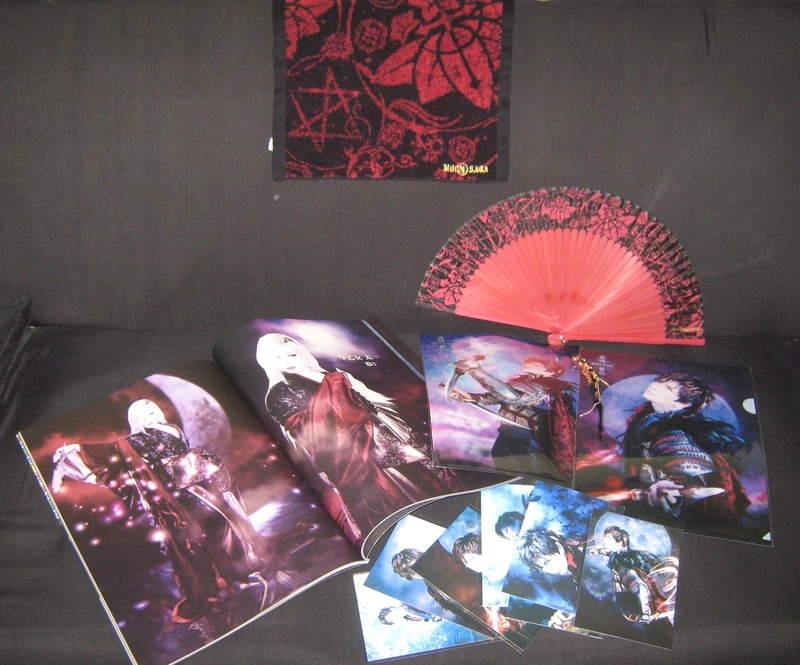 I’m going to miss being a member of GACKT’s official fanclub and going to his concerts. But I can’t say that I’m going to miss being this ill-defined and ever more ambiguous thing called an ALT. I’m not going to miss people who don’t give me papers because they assume I can’t read them, or people who give me papers and say, “Oh, but you can’t read it, it’ll be good study then. Hahaha.” I’m not going to miss having 40 pairs of eyes looking blankly through me. Well, 39 pairs of eyes. There’s usually one in each homeroom who’s listening, and I don’t know what I’d do without them. This is over a week late, but I’ve been crazy busy. During all the mayhem, I was able to squeeze in one showing of MOON SAGA~Yoshitsune Hiden~ and one visit to the GACKT X KIMONO Project exhibit. I went to the kimono exhibit on Tuesday the 14th with two friends. 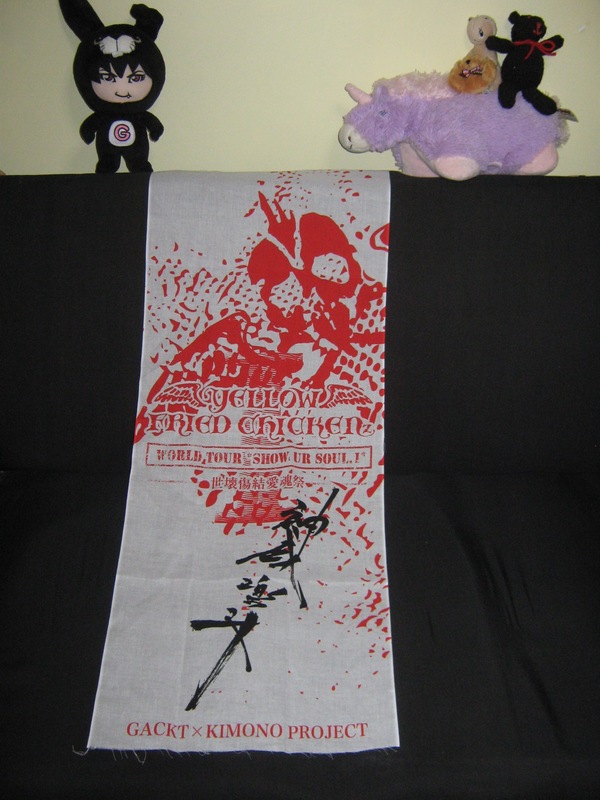 Admittedly, I only went to get the free “GACKT produced” tenugui advertised on the site. So I made a reservation and anxiously awaited the invitation as the day drew near. 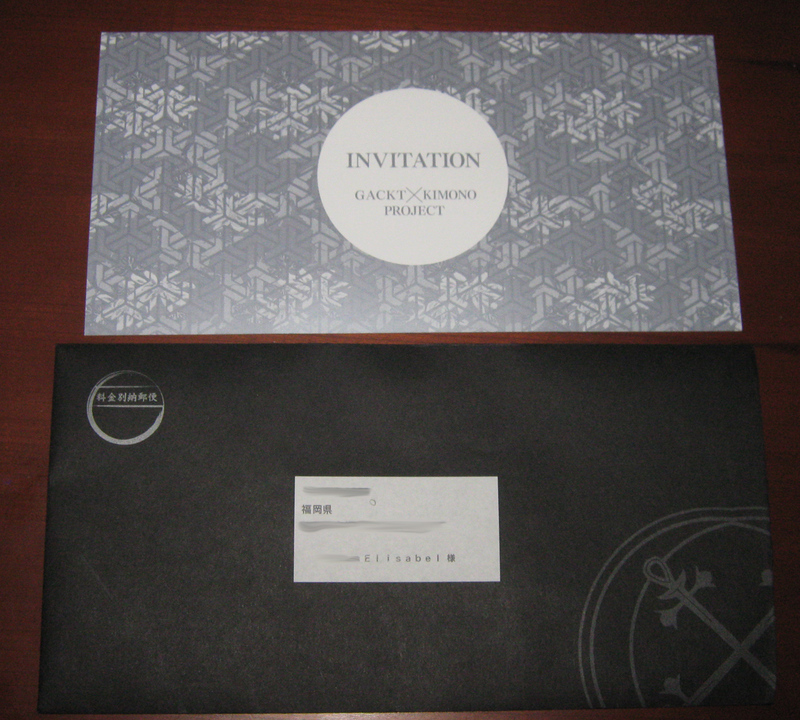 If it weren’t for the Nemuri crest I’d think this envelope was from the Liar Game Office. Perhaps the staff sensed that we weren’t gonna buy anything, as they just kept on emphasizing how expensive the kimono were. The older gentleman did say once or twice that the yukata were much more affordable, but still, no hard selling going on. Which is a shame for them as salespeople; despite my nearly complete lack of interest in wearing kimono or yukata it probably wouldn’t have taken much swaying for me to get the hot pink & black yukata with the Nemuri crest just for the hell of it. ^_^; It’s one of those “I’m in Japan, might as well” things. The other piece that had me seriously considering parting with my hard-earned dough was the black and white kimono with the DEARS logo on it. I would never wear it, it was too beautiful for that! I think it may be the “secret model” the Kimono Project site was talking about; at least I haven’t seen it in any of the photos on the site of the various lines. Anyway, despite our invitation saying that the showing was from 7 PM, at a little past seven the staff said to us, “We have the venue until seven, so…” With that they collected our invitations and the gentleman brought over the tenugui. Only what we saw in his hands wasn’t the tenugui my friends and I were expecting. Perhaps the feeling that we were being given leftovers was what made getting this disappointing. Can’t look a gift horse in the mouth, but…not as advertised! We left the exhibit feeling a bit confused, but oh well. Only two more days till seeing GACKT live again! Well, saying “business trip,” the common translation for 出張, sure conjures up a different image than what it actually was, but that’s what it’s called when one goes somewhere other than their usual workplace on some work-related thing. The thing that had been keeping me crazy busy was planning for the first ever overnight English camp put on by Fukuoka Prefecture, taking place in none other than the Dutch-themed park Huis Ten Bosch in Sasebou, Nagasaki Prefecture. It was decided that all ALTs involved in this camp should go to the park for a preview (good) on the 16th (yikes!). It’s been a while since I’ve cut something that close! 18:03 Our chartered bus pulls up to Hakata Station, our group leader just says “Go, go!” to me and I dash off forgetting to even say “otsukare” to the team. 18:13 Arrive in Tenjin Station. I stay underground for a bit but since I’m not too familiar with the underground I go up once I see a sign for the Fukuoka Building. When I get on the top streets and cross Showa-doori, I notice another person running. I wonder, “Are they going to the play too? !” but then it hits me: the lights on these two blocks must turn green at the same time. So I dash off after this guy and just barely make it across the next light. I keep running! 18:25 Am seated in my 16th row seat sweating profusely but with time to spare before the curtains rise! Unlike with the play Nemuri Kyoushirou, I didn’t want to read fan reports before seeing the show myself so that I could see how much I understood on my own. All I knew was that this was going to be some sort of magical fantasy version of the life of Minamoto no Yoshitsune, and that eventually there would be vampires, or the precursors to vampires (it is a part of GACKT’s whole MOON SAGA project after all). The play initially did not disappoint. It was funny, GACKT was adorable, and there was pandering to the local audience by the truckload! One of my minor “complaints” about Nemuri last year (or whenever that was) was that GACKT did not participate in what little Fukuoka gags there were, but this time, the whole cast busted out niwaka masks while saying 「ごめーん！」during…I don’t even remember what scene it was. I was just geeked to see the masks. Later in the show, Benkei’s actor went down the left side of the audience handing out these autographed masks, saving the one signed by GACKT for a girl near the front. About midway through, however, I started to wonder, “what is the point of this?” It probably didn’t help that I needed to use the bathroom and was waiting anxiously for an intermission that never came. Anyway, I had done very little reading up on the play, so other than the characters I didn’t know much what the story would be about. The sets were interesting, the costumes were cool for the most part (not impressed by the bootleg Jack Sparrow look on Yoshinaka ^_^;), the music was fitting, and the dancers did a great job. And Kage’s fight scene! WOW. But still, as a story, I was left unsatisfied by ~Yoshitsune Hiden~. It felt anticlimactic. I know it’s part of a larger work, but the play should still be strong by itself, but that last fight scene left me thinking “…that’s it?” The use of wire work as cool and all, but…that’s it? I think I would feel like this play didn’t have a proper ending even if it weren’t for the Swarm of Green Ninjas scene from Nemuri Kyoushirou to compare it to. The play ended, but then the cast did a slightly changed version of an earlier scene as an encore. (I assume it was an encore, as most of the audience seemed surprised by the cast reappearing on stage ready for that scene.) I can’t remember now if the credits rolled before or after this. In any case, as it was the last Fukuoka showing, I wanted to stick around and see if GACKT would peek out, but since I hadn’t bought any goods and didn’t want to end up in a long line (I had a seat close to an exit), nor did I want to make my friend wait, I busted out with the other patrons and went to get some goods. I see Kage and think of Sephiroth, but my friend, a CLAMP fan, thought of one of their other characters. It would be nice if shows were added at venues on Kyushu, then I’d like to see this play again and see if maybe the latter half doesn’t leave me so “meh” after having seen it once already. As it is, I was happy for the chance to see GACKT again for the first time in 10 months, and enjoyed the overall artistry of the play. Story-wise…I’m gonna have to wait and see what else the MOON SAGA has in store. EXILE is a very popular 14-man music group: 12 dancers and 2 vocalists. Given how hugely popular they are, it always used to surprise me when students who told me they were big EXILE fans couldn’t tell me what “exile” meant. When I would tell them that it means 「追放」they always reacted with surprise. They don’t get why the band is called that either. For me, not knowing what your favorite group’s name means is the perfect example of what happens when a language is used as commercial glitter. When ALTs say that students don’t have enough chances to listen to real English, I think, is the problem that, or the opposite? I think they have too much English floating around, both of the grammatically correct kind and the “all your base are belong to us” variety. I think English in Japan has become a part of the background noise, like the hum of electric appliances. You never notice that they are constantly making a sound until there’s a black out. Maybe there’s also a certain level of naiveté involved, but I hesitate to reach for this conclusion because I think it’s a bit condescending. Is it paranoia that makes me think, “don’t wear clothing with text you can’t read,” “don’t repeat things whose meaning you don’t know,” or just good sense? I debated with myself if I should tell them what that meant. On the one hand, I think, as girls they should be aware that there’s this language that’s not very nice to them so that they can avoid promoting it. On the other, I wondered what they would think of the fact that I knew how to say that in Japanese off the top of my head. Ultimately I did tell them. I think they should know in general because this stuff is out there, and I don’t want them to embarrass themselves by saying bad words without knowing they’re bad words, or by saying they like certain music without knowing what that music is really about. Can you imagine a potential host family’s reaction if these girls went abroad and took a CD with such tracks as “Drink Beer” and “Stinky P***y” as an example of the music in English that they listen to? And I do hope that it’ll make them think twice about what it is they’re listening to, and sometimes buying. I want English to stop being just more background noise. Well, the school festival was two weeks ago, but I’m just now getting around to posting this. At my old school I didn’t really get a chance to experience the culture festival as a whole because I spent the morning of the second day judging the speech contest for junior high students that my high school hosted. In the afternoon I would see the second performance of English play, and by the time that finished the individual homerooms’ and clubs’ “exhibits” would be over. At my current school my responsibility was to ESS, which means English Speaking Society. In other words, English Club. 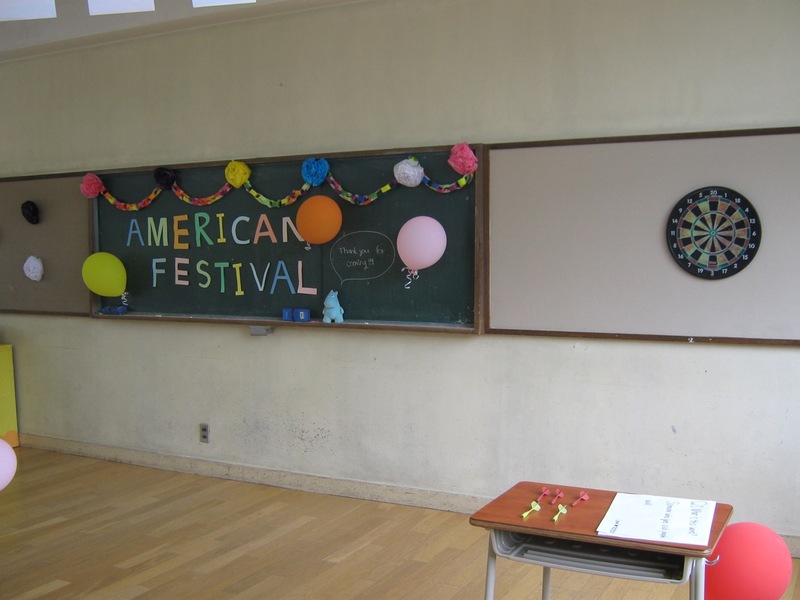 We decided a few months ago that we were going to have an American Festival. The plan was to have several games: darts, the touch game (手探りゲーム? Milton Bradley makes one called “Feeley Meeley” but I don’t know what you’d call this type of game in English; you put your hands in a box and try to guess what it is you’re touching without looking at it), face painting, fortune telling, and the centerpiece: piñatas! Looking up to the ESS exhibit room (which wasn’t the usual club room; the exhibits are done in the homeroom classrooms) from the inner school garden. 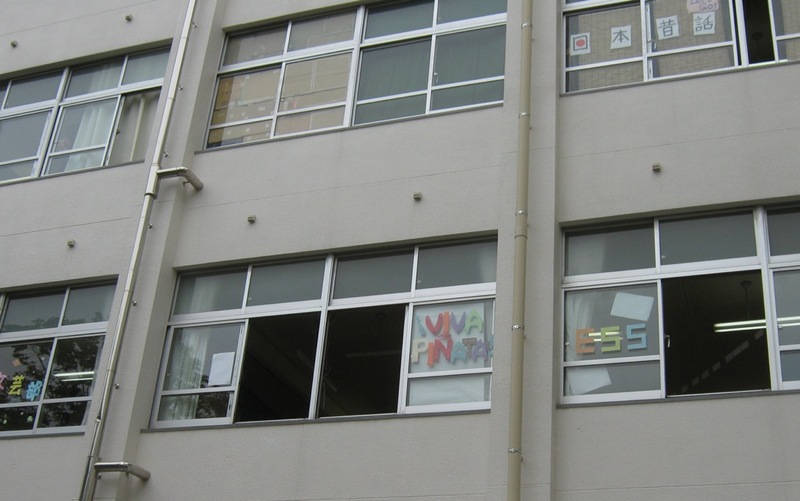 I explained to the ESS students that “Viva!” was sort of like “banzai!” I also tried to explain that there had been a freakishly adorable TV show called “Viva Piñata,” but I’m not sure how much of an impact that made. Ah, the day of I learned to make balloon animals from the instructions on the balloon’s package. That’s pretty American Festival-ish, right? 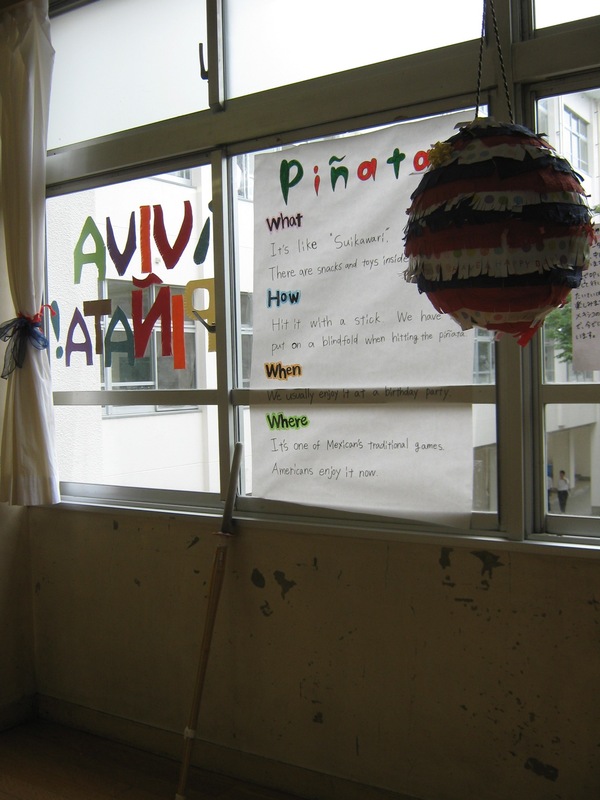 As for the piñatas themselves, we made it so that each person only had 30 seconds “at bat.” Well, “at shinai.” We didn’t have a regular stick so we borrowed a bamboo sword from a member of the kendo club. I wish I could share the precious photos of students hitting the piñatas with those formal kendo downward strikes, but alas. We made 5 piñatas in total. The rules written on the board explain the piñatas and the darts game. The first day of the festival was just the brass band concert and the chorale competition. The exhibits were opened, but in ESS’ case we didn’t actually let the guests play the games since, in the case of the piñatas, our hard work gets destroyed. The second day we had guests from the community, elementary and middle schoolers, and even a local radio station drop by and check out the zaniness, as well as the students of the school itself. Unfortunately, despite my best efforts to reinforce the piñatas around where the string is inserted into them, all of them just ripped off the string and ended up on the floor. One pair of youngsters just stuck their hands in the hole to get the superballs, not understanding the “you can hit it until it breaks” concept. The boys of my own school, however, had a blast just beating the life outta the poor piñatas à la suikawari. While all this was going on, I sometimes went out of the ESS room to check out the other exhibits and of course, the “Culture Stage” which featured live music. I made sure to check out the band of seniors that went by the name “Williams” because they had L’arc~en~ciel’s “READY STEADY GO” on their set list. I also went to see the shamisen performance of one of the first year students. Now that bunkasai is over and finals are upon us, we have to plan the farewell party for the senior members of the club. From second semester on, the seniors “retire” from their clubs to make time for studying to get into a university. The ESS members said they wanted to have a piñata party, since they themselves didn’t actually get to play. Part of me sheds a tear whenever a piñata is put out to fulfill its cruel destiny, but ah! such is life. Again I must go to the dastardly enterprise. Aight, I’ma stop using the thesaurus now. The home ec teacher had invited me to one of the classes several months ago, a class with seniors. It seems to have been an elective. 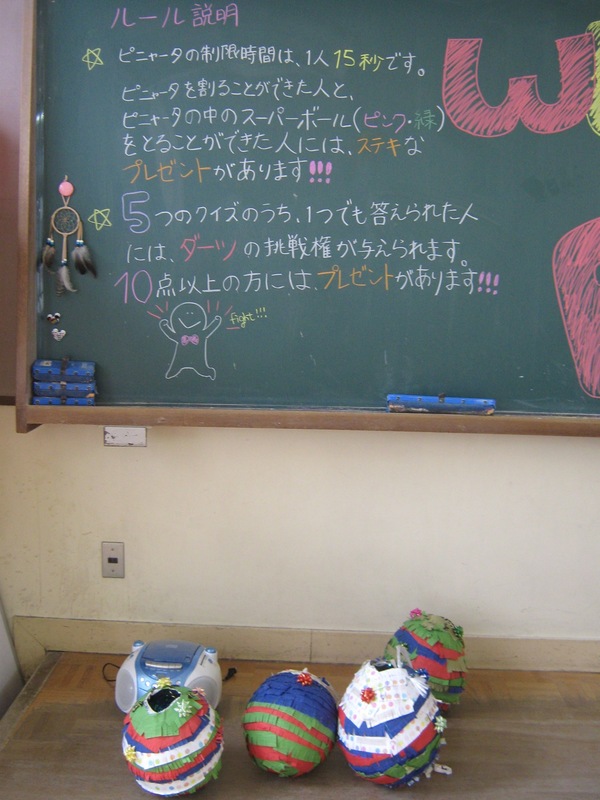 I tried to ask how the students picked that class, since it wasn’t the whole homeroom and there were 2 boys in there who obviously would have rather been elsewhere, but between my Japanese and the teacher’s English, it wasn’t completely clear to me. Well, the class also seems to have been only for one or two terms, as that group of students will no longer have that class starting 3rd term. Anyway, it was a two hour class on Fridays 3rd and 4th period, but I always had a class on 4th period, so I never got to see any of the recipes completed. The teacher or the students would take the finished dish up to me in the teachers’ room during lunch. In total, I helped make about 8 dishes and got to eat 5 of them. I don’t carry a camera to school, so most of these photos were taken with my laptop’s webcam. Suffice it to say I made a huge mess with the flour. 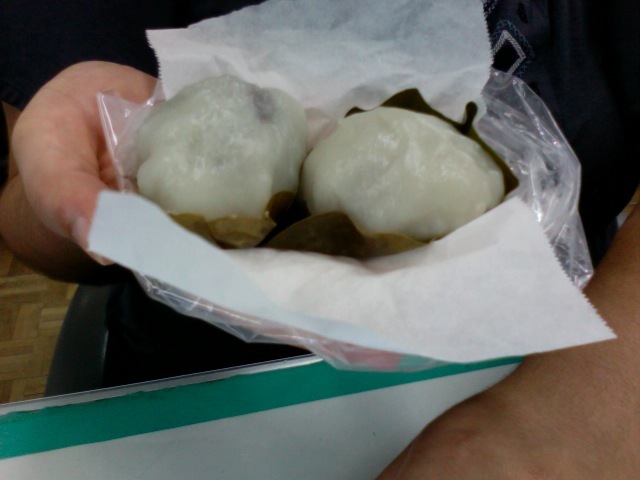 ^_^;;; The mochi flour was steamed for a bit, then the red bean paste was put inside, and the whole thing wrapped in a leaf to steam some more. Very chewy. The dagojiru was a type of Japanese stew featuring iriko (dried sardines), pork, gobou (burdock root), konnyaku, and shiitake mushrooms. I learned how to peel the burdock root (using the back of a knife’s blade) and how to cut konnyaku with the edge of a bowl to make the edges jagged and thus more flavor-absorbent. I seem not to have a photo of this. Whoops. This time I knew how to not mess up the flour, ahaha. I also worked with a group of students instead of just helping the teacher do the demos as I had been doing the previous two weeks. We talked about cooking and food in the States. Or rather, food in my neck of the woods. I told them I don’t know everything about food in the States since I’ve never been to half the country. I’ve never even been west of the Mississippi, ahaha. Since I don’t have class with these students, and they were obviously not wanting to speak English, we just conversed in Japanese. Though one girl was at least saying simple things like “please mix!” in English. Since this recipe didn’t include any ingredients that I was unsure of my ability to recognize in the supermarket, I tried to make it at home on my own later! It turned out okay, despite the fact that I didn’t have any way to measure grams and was just eyeballing every amount that wasn’t measured in cc’s. ^_^; I made it the same week as the fourth dish, the pumpkin cake featured in the teaser post. 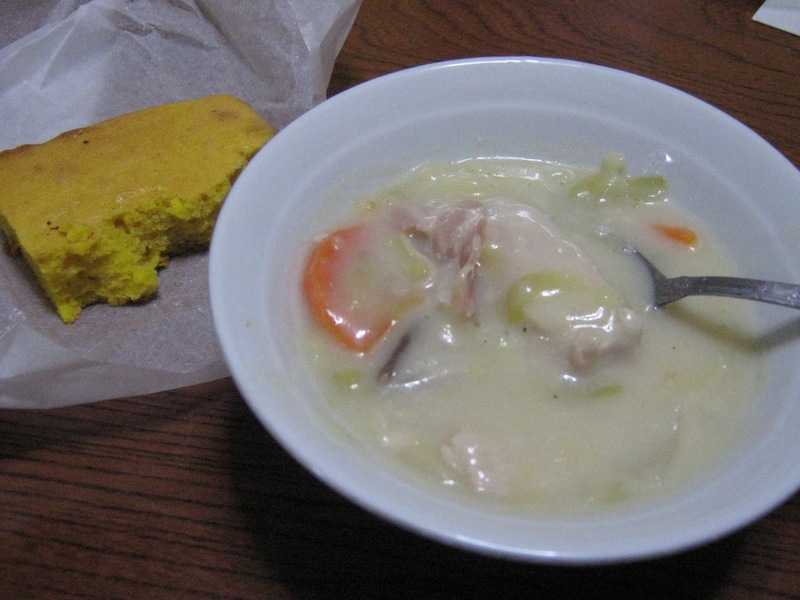 Somehow, it ended up tasting totally like cornbread! Meaning, a “decorated” cake. I thought it would be Christmas cake, but it was too early for that. This was the last class. 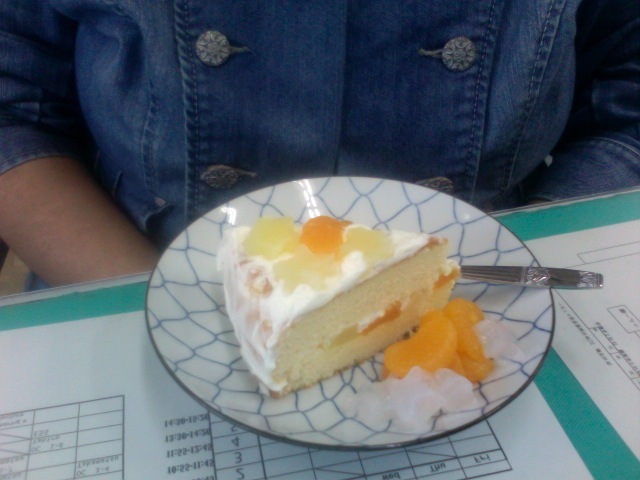 I also helped the students make “American muffins,” but what I got was a slice of deco cake. The decorations consisted of fresh fruit and star-shaped nata de coco.